Roughly 75,000 children under the age of 5 visit the emergency room each year due to an injury caused by a baby product. We all value the safety of our children and the manufacturers of baby products have an obligation to ensure that their products are safe. However, some products are simply designed poorly, defective, or used improperly; all of these situations can result in possible injury or death. Strollers cause nearly 12,000 injuries every year. Many of these injuries involve either strangulations or falls. Ensure your child meets the recommended height and weight requirements. Acquire a stroller with brakes that are easy to use. Be sure to use them when needed. Use the buckle/seat belt system to prevent the child from falling out. Use it properly to prevent strangulation accidents. Avoid leaving any child unattended in the stroller. Baby bathtubs are another cause of injury and death. Over 40% of child drownings occur in a bathtub. 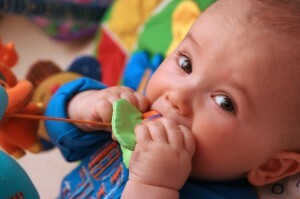 Toys with small parts: Choking on small items is the leading cause of toy-related deaths. The common advice is to never let any child under the age of 3 play with anything that can fit through a toilet paper tube. Baby monitors: While many parents consider these to be safety items, there are a few strangulations every year due to the electrical cords. Be sure to keep the monitors and cords at least 3+ feet away from the baby. Baby slings: Few suffocation deaths occur each year, mostly in children under 4 months of age. Be sure the sling is being worn properly (the most common cause of injuries) and that the babies face is always visible. Don’t permit the baby to bury his or her face. Portable play enclosures: Several deaths occur each year along with several hundred injuries. These are primarily due to faulty side rails. Keep these items away from electrical cords and anything the child can pull down upon himself. Also avoid using more bedding than necessary. Various baby seats: There was a recall in 2012 of over 4 million Bumbo infant seats due to several reported falls. Some of these falls resulted in serious head injuries, including skull fractures.It is up to us to keep our babies and children safe. We have the right the expect baby toy and gear manufacturers to provide us with safe items. All too frequently, poorly designed or defective products are responsible for the injury or death of a child. For more articles on injury and safety visit my injury blog. Thanks!